You’ll know of today’s story if you’ve been following the news for the last week. It’s the story of the couple who won a $2.9 million judgment against an oil & gas company for “creating a private nuisance.” Our story today gets into the detail of what was behind the judgment. There are three things that you should note as you read this. First, the couple did not have a well on their property. They did not have a contract or receive any payments. They just had the great misfortune to live near a bunch of wells that ruined their health, the nearest one over an eighth of a mile away. The second thing follows yesterday’s post about the environmental and health impacts of the oil and gas boom. They are real, they are more significant than people want to believe, and there are going to be more people whose health is going to be ruined as drilling expands into their neighborhoods. And the third is the familiar refrain on this blog of the helplessness or unwillingness of state and federal agencies to step in and stop a serious problem. These are lessons we need to take to heart along the Beartooth Front. Oil and gas drilling affects everyone in a community, it will have a significant impact, and government agencies will not help us. If we want to keep this from happening, we will need to take the responsibility to stop it ourselves. 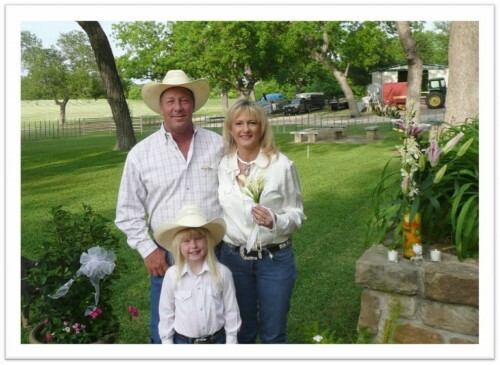 In May 2008, Lisa had married Bob Parr on golden colored stone steps at his country home in east Wise County in Allison, Texas. The back porch overlooks a picturesque setting. Horses and cows graze lazily in a green pasture. Denton Creek winds along the back of the property, bringing with it a lush river of trees along either side. It seems impossible that such an idyllic scene would become the backdrop for the poisoning of the Parr family by a laundry list of industrial neurotoxins. But the impossible would quickly come to pass. Lisa first felt sick in fall 2008. As the immense trees across her 40 acre homestead dropped pecans, she began to experience a host of unexplained ailments. The typical remedies didn’t work. Lisa was treated by eight different doctors over the course of a year. A source of the sickness was never determined. In June 2009, exhausting everything he knew medically, her internal specialist suggested that something in the environment might be causing her various ailments. In early fall 2009, she visited an environmental doctor who conñrmed the presence of neurotoxins in her blood that matched chemicals used in natural gas production. Medical tests confirmed the toxins in Lisa’s system matched toxins found in the atmosphere in an air quality investigation conducted by the Texas Commission of Environmental Quality (TCEQ) at a nearby well site. On the evening of July 25, 2010, the Parrs smelled a strong odor emanating from a frac tank at a site operated by Aruba Petroleum of Plano, Texas. They reported it, and investigators arrived within hours to capture air samples. eye.” The petroleum-like odor was so intense the investigator himself felt sick in the short time he was there, noting dizziness and a sore throat. The analysis found five compounds that exceeded safe values for short-term health and another 20 exceeded safe levels for long-term effects. The investigation found elevated levels of ethane. pentane, hexane. octane, xylene and nonane, all potentially toxic chemicals. Four days later, a medical test discovered the same chemicals in Lisa’s body. ‘The environmental specialist ran numerous tests on me.” Lisa said. “l had about 20 of the chemicals they use ín the oil and gas industry in my tissues and in my blood system. Never in my life had I been so sick. Aruba was the operator for many of the wells surrounding the Parr home. TCEQ received dozens of odor, spill and nuisance complaints from Allison residents in the community, and, according to a 2010 news article, enforcement actions were pending against two nearby Aruba sites, one for nuisance and another for violations without authorization. The company had been fined more than $30,000 in the year prior to the 2010 article by the TCEQ. Those of you who have followed this blog will note that ECA, which is drilling wells in Belfry and Dean, has a similar track record in Pennsylvania, where they have 66 inspections with violations, 90 separate violations, and 55 enforcement actions with fines totaling over $80,000; and 70 more violations in West Virginia. While the Parrs had no wells on their property, their location makes it a natural pocket for collecting heavy toxins. At one point the lymph nodes on her neck swelled as big as pecans. A doctor suspectd she had lymphatic canœr, but it turned out to be only a reaction to the toxins. “Waiting on those results was two days of emotional trauma.” she said. Bob and their seven-year old daughter Emma felt sick as well. Emma was diagnosed with asthma. She’d never had any respiratory problems. She also started breaking out in rashes and having stomach problems. She showed the results to her doctor. who told her to leave her home within 48 hours. On Saturday, Aug. 28, 2010, they said goodbye to what was once their dream home and moved into Bob’s office. Bob and Lisa Parr aren’t the sickly type. Bob built his home in 2001. He’s enjoyed a long career in stone masonry and raising cattle. His home reflects the rugged outdoor lifestyle he enjoys. Walls bear the trophies of big-game hunting in the wilds of Alaska. Black bear, mountain lions and elk are mounted on high wooden walls. “We had no help. We have someone who is contaminating our air. It has affected our cattle. We‘ve lost pets. We’ve lost chickens. 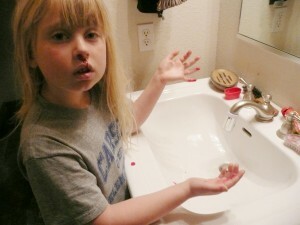 We all got sick, and we got no help,” she said. In 2011 the Parrs had had enough. They filed suit against Aruba. 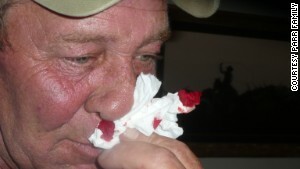 The common practice in a case where the evidence is as clear as it is in this one is that the drilling company will settle, and one of the provisions of the settlement will be a gag order that prevents the damaged family from talking about the details of the settlement for the rest of their lives. This leaves the rest of the world in the dark about what the company admitted to and what the nature of the damages is. But in this case, perhaps for the first time in history, Aruba took the case to trial. It wasn’t because they felt they were blameless or there weren’t damages, but they felt that because there were other drilling companies in the area, and because Aruba had met state standards, there is no way they could be held at fault. The verdict was less than the Parrs had sought in their complaint, which was $66 million in damages. This is because the jury rejected the Parrs’ claim that Aruba acted with malice, therefore denying their bid for exemplary damages, according to a Law360 report (login required). This entry was posted in Personal stories and tagged Aruba Petroleum, Bob and Lisa Parr, ECA, Lawsuit, neurotoxins, personal stories, private nuisance, property value, TCEQ, Texas, violations, Wise County. Bookmark the permalink. This kind of thing is going on all over the world where fracking is tried. Public opinion is clearly growing against fracking. Some places are slow catching on, but the people living near fracked wells always come around in time. The smart ones are out ahead and understand before it hits. David, could you reach out to me please on the associated email address.